Two cruises marked the 100th anniversary of the sinking of the Titanic - - the Titanic Memorial Cruise left from Southampton, England on April 8, 2012 and the Titanic Anniversary Cruise, which left from New York on April 10, 2012, 100 years from the day that Titanic set off on her final voyage. Both cruises were organized by Miles Morgan Travel. "Miles has a set of retail shops in the west of England. Customers [asked] about the Titanic and what were the opportunities to visit the area where she rests. And thinking about the centenary, ideas came up through that," Andrew Phare of Miles Morgan Travel explained. Both cruises were designed to provide "similar experiences. The planning from inception until now has been five years,"
The two cruises were "charters." In essence, a charter is where someone or some entity rents a ship and its crew for a voyage. Although the cruise line's staff still operates the ship, the entity chartering the ship decides where the ship will go and what will happen onboard during the voyage. Often, such as when a corporation charters a ship to act as the venue for a sales conference, the voyage is closed to the general public. However, as was the case with the Titanic cruises, the entity chartering the ship can sell tickets for the voyage to the general public. For the Titanic Memorial Cruise, Miles Morgan Travel chartered the Balmoral of Fred Olsen Cruise Lines. 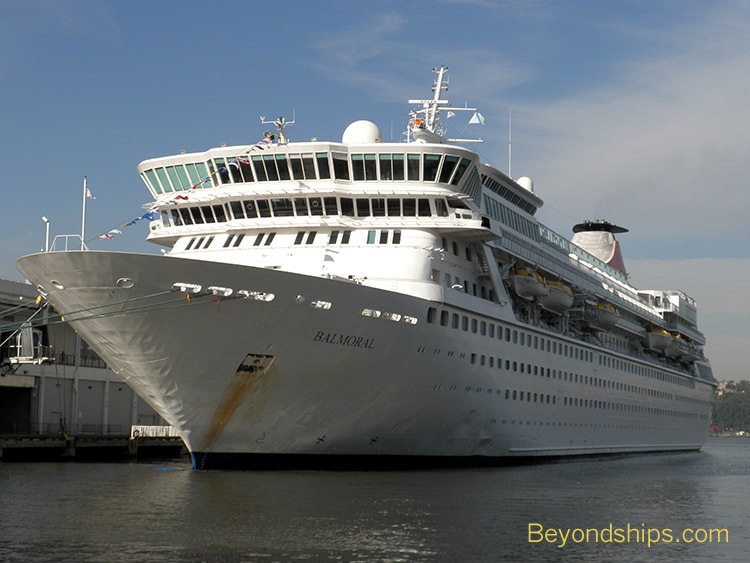 This ship is 43,537 gross tons and can accommodate 1,340 passengers double occupancy. Normally, she does mass market British cruises. For this cruise, she was to do an Atlantic crossing from Southampton to New York with calls in Cobh, Ireland and Halifax, Nova Scotia, very roughly retracing the route that the Titanic followed. "The Balmoral sold very fast, very quickly," noted Phare. Seeing how well the Titanic Memorial Cruise had sold, Miles Morgan decided to charter a second ship for what it named the Titanic 100th Anniversary Cruise. This cruise was to be round-trip from New York with a call at Halifax. It can be thought of as following - - albeit roughly - - the route of the ship that rescued the Titanic survivors, Cunard Line's Carpathia. "Azamara Journey was available. She held the number of passengers that we felt would probably be interested," explained Phare. Consequently, Azamara Journey was chartered for the Anniversary Cruise. The Journey normally spends her time roaming the world doing port-intensive cruises. At 30,277 gross tons, she is about three quarters the size of the Balmoral. Furthermore, since she is an up-market cruise ship, the number of passengers is limited to about half that of the Balmoral. Azamara Journey's atmosphere lent itself to a Titanic cruise. Decorated in the style of a grand English country house with wood paneling, fireplaces and club-like furnishings, Azamara Journey recalls a world with which Titanic's first class passengers would have been familiar. 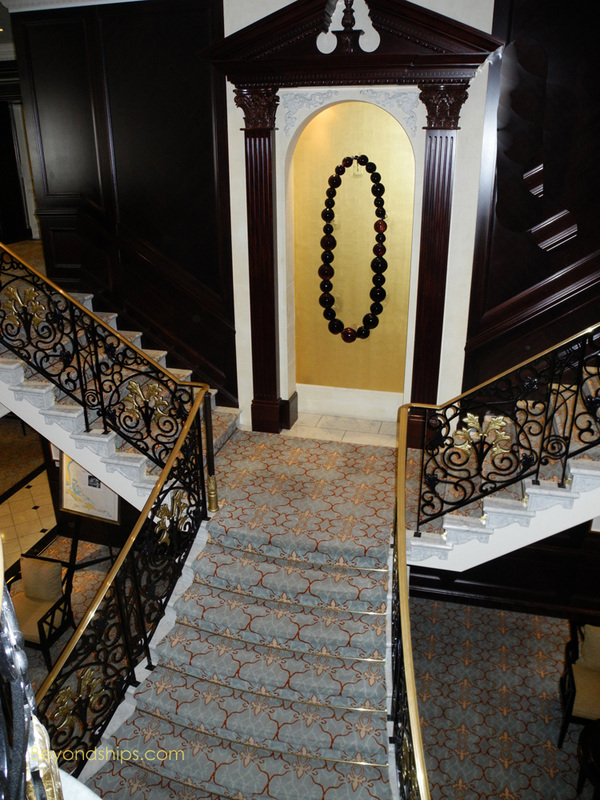 Above: Azamara Journey's lobby staircase. "The ship is very elegant. She is appointed in a very traditional, classical way and life onboard is casually elegant. 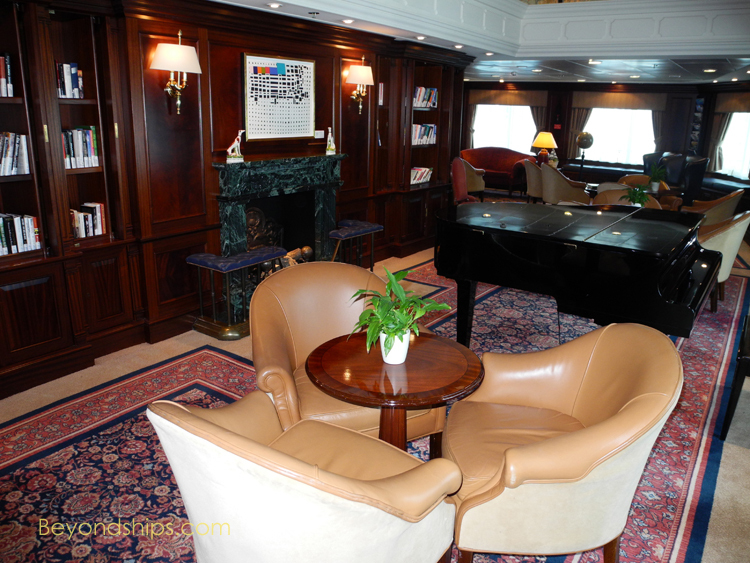 It is a very relaxing atmosphere" Captain Jason Ikiadis, Master of the Azamara Journey, told me. In addition, while Titanic carried many more passengers than Azamara Journey, Titanic's passengers were segregated by class. There were approximately 325 people traveling first class and they would have experienced a relatively intimate but luxurious world. A relatively intimate but luxurious cruise experience is exactly what Azarmara Journey seeks to provide. "You are getting the high end service, the high end food, the appointments of the ship but at a value for money price point." Azamara Journey is not an ocean liner like Titanic but she nonetheless has the ability to handle a North Atlantic voyage. "She is very well-designed. We have adequate ballast facilities to make the ship slightly heavier in rough weather. She is fully stabilized and all in all, in my opinion, she is a very stable ship," Captain Ikiadis said. The ship's seakeeping abilities were put to the test during the Titanic Anniversary Cruise. The North Atlantic can be rough in April and after the Journey left New York she encountered grey skies, high winds and swells. Still, the little ship did indeed handle it well. Life proceeded apace inside the ship with little discomfort for the passengers. Above: The Balmoral of Fred Olsen Cruise Lines sailed the Titanic Memorial Cruise. Left: Captain Jason Ikiiadis of Azamara Journey.